Copenhagen, Aug 27 (IANS) Top Indian women's doubles pair Jwala Gutta and Ashwini Ponnappa were ousted in the second round of the World Badminton Championships, losing to Chinese fifth seeds Qing Tian and Yunlei Zhao in straight games on Wednesday. 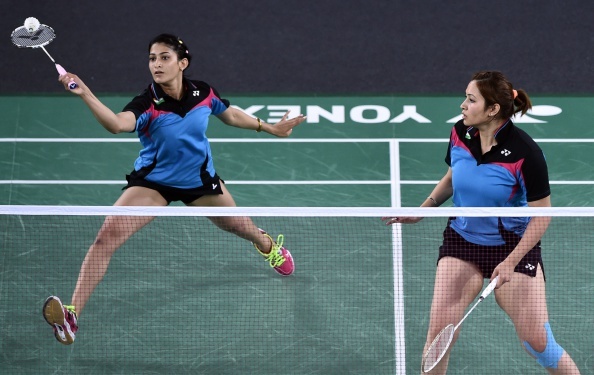 The World No.7 pair tamed Jwala and Ashwini 21-16, 21-8 in only 31 minutes at the 9,200-seater Ballerup Super Arena. This is the World No.21 pair's seventh loss in as many meetings against the Chinese combine. Qing and Yunlei dominated from the start to take a massive 15-7 lead in the first game. However, the 2011 World Championship bronze medallists closed to gap to 13-15 before the Chinese raced away to take the game. The 2010 Commonwealth Games champion did not even stand a chance in the second as the reigning Olympic champions tamed their Indian opponents to proceed to the third round. However, Manu Attri and B. Sumeeth Reddy won their men's doubles opener late Tuesday evening to progress to the second round. The duo defeated Russian pair Nikita Khakimov and Vasily Kuznetsov 21-19, 21-23, 21-19 in exactly an hour and will take on Japanese 15th seeds Hirokatsu Hashimoto and Noriyasu Hirata later Wednesday. Eleventh seed P.V. Sindhu (women's singles), Pranaav Jerry Chopra and Akshay Dewalkar (men's doubles), Ajay Jayaram and Kidambi Srikanth (men's singles) will also be seen in action later Wednesday.